I'm sure this is an easy question for you. Name a book, any book? Could a question get any easier? Apparently, for a lot of people, it could. 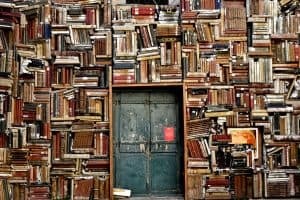 I'm sure you're all familiar with the shocking statistics showing that 33% of high school students and 42% of college students will never read another book after they graduate. However, I always assumed that even though people weren't reading books, that they knew about books, or at the very least knew that the shows they were enjoying were books first. Unfortunately, according to a video interview segment by Jimmy Kimmel Live, that was the wrong assumption to make. In this segment, Kimmel sends a team to the streets to find out if people are really as illiterate as the surveys and research suggest. The results are painful to watch. So there you have it. I for one hope that maybe this level of dismal is a combination of on-the-spot brain and good editing, but still, all they had to blurt was the name of something popular like "Harry Potter" or "Game of Thrones." All good things started as books. Do you think there are people in your life who couldn't name a book? Let us know in the comments below. I'm sure that there's at least one or two people that could only name a book they've "heard" of - not read. It's sad, but true. I can't imagine that anyone I know couldn't name more than one book! This is so sad,I read every day.The last hour of Gann by R Lee Smith is my favourite. Oh my gosh. that's horrible. I read at least a dozen books a year even though I work full time. I always have an answer when someone asks me what book I last read. Bet if you asked them to name a movie, they'd have an answer. Sad thing is, most movies today are based on books, yet everyone forgets that part. I read thousands of books, and given time I could write down hundreds, maybe thousands, of book names (including many I never read). But when I read the question it took me time before I found a single name (my favorite book), and then I had a hard time remembering the author's name. So I could well be speechless if asked in the street. My daughters, grandkids and I could all name lots of books. My son...not so much. But he could surprise me. Unfortunately, I’m sure there are. When I saw this, which was before I got this, I was shocked. I thought that, at the very least, they would come up with Harry Potter. I could name several, I can not believe that all those people were drawing blanks. I hope that it was just the editing or nervous due to being put on the spot. So sad. Almost appalling that people don't read! Last book i read- the difference Engine by william gibson. More books to read over memorial day weekend! Yay! Reading is not taught in school anymore. When I was in high school and could not drive my Mom would drive me to the public library every Tuesday. I would check out 4 to 5 books and we would both read them. Yes. They are too busy texting each other on their cell phones to bother reading a book. I raid free sources online everyday for e-books. Anywhere I go, while waiting, I am occupied reading a book. BIBLE, Little House on the Prairie, Nancy Drew series, Virgin River series by Robyn Carr, McKettrick and Creed series' by Linda Lael Miller, Mule Hollow series by Debra Clopton, just to name a few. To not read is scary. I probably read 5 books a month. Try the Bible it tells you all you need to kniw. This makes me dear for the future of our children! If asked point blank like that, I probably couldn't come up with a name of a book, but I read something everyday -- so many that I have trouble remembering the names. One I read almost every day is the Bible. Somehow, I don't actually think of it as a book, but something more. I know there are and it is absolutely one of the worst things I can think of. I wonder how many people who actually answered with the name of a book or two that they left out of the video they showed. My husband, who doesn't like to read anything but tech magazines, came up with The Bible almost immediately. I was surprised he thought of one so quickly.